We all want Vladimir Guerrero Jr, but we are going to have to wait until Toronto moves him up due to service time. He is going to be the exciting bat to watch when that day comes. On paper Toronto doesn’t look like much, and a lot has changed since the Jose Bautista and Edwin Encarnacion were mashing baseballs. Kendrys Morales and Justin Smoak are now the two power bats in the middle of the lineup. Both aren’t eye popping power bats, but they can flirt with 30 HR most seasons lately. Lourdes Gurriel and Billy McKinney will be names that bat at the top of the order most nights. Randal Grichuk is a big power bat, but has that boom or bust tag that limits his ceiling across all categories. Toronto’s middle infield is a little rough as Freddy Galvis and Brandon Drury are lackluster options. Toronto has been losing names left and right among starters, and right now their rotation is not in very good shape. They already have to face three tough offenses within the division, and also face them in good hitters parks. 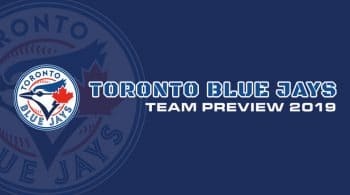 The Blue Jays have some young talented hitters coming up, but their goal of developing an ace should be front and center right now. They likely won’t be spending on anyone big, so through the farm system is their best bet. They were a mediocre pitching staff in 2018, and it is hard to see something different in 2019. Marcus Stroman comes in as the name we most know. He is a groundball arm, that has struggled a bit over 2018. He finished with over a five ERA. While he is not a strikeout arm, his strikeout stuff was down from the prior season. Stroman was never going to be a top of the rotation arm, so it shows where the rotation is at with him at the top. Toronto added Matt Shoemaker and Clayton Richard, who both get a downgrade moving to Toronto and facing the AL East. Shoemaker and Richard work differently, as Shoemaker is a flyball prone right-hander, and Richard is a groundball southpaw. Shoemaker could be in some bad spots against these offenses. Richard was over a five ERA last season, and Shoemaker was near him at 4.94. Both are projected for over a four ERA this season, and taking the over would be wise there. These will be telling years for both of them. Aaron Sanchez took a step backward after a promising 2017. He finished with a 4.89 ERA and his strikeouts were down as well. Sanchez has some upside, but it seems a bit capped within this division. While Ryan Borucki had a 3.87 ERA last season, his batted ball stats and ERA estimators have him about a half of a run higher in 2019. There isn’t really much depth behind these guys, but Sean Reid-Foley will get some run this season, and showed some strikeout upside late last season. There is a good chance he can knockout one of these starters from the rotation and jump right in.